Terra Cotta Warriors were buried with the Emperor of Qin (Shi Huang Di) in 209-210 BC. Emperor Qin Shi Huang Di (259-210 BC) was the fist emperor of China ascending the throne at the age of 13 reign from 246 BC to 221 BC and unified China from 221 BC to the end of his life in 210 BC. Emperor Qin marked the beginning of Imperial China, a period which lasted until the fall of the Qing Dynasty in 1912. In 1974 between May 18 - Oct 12 while digging a well, Chinese farmers unearthed a terra-cotta head. Further excavation uncovered immemse subterranean necropolis containing the tomb of China's first emperor Qin Shi Huangdi. 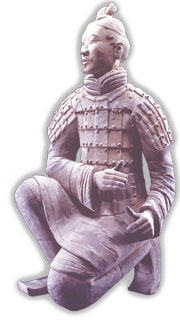 Terra-Cotta figures vary in height (6ft - 6ft 5in). The figures include warriors, chariots, horses, official, acrobats, strongmen, and musicians. Current estimates of the Terracotta Army are about 7,000 soldiers, 130 chariots with 520 horses and 150 cavalry horses, the majority still buried in the pits. The Terra-Cotta Warriors and Horses are the most significant archeological excavations of the 20th century. Work is ongoing at this site, which is about 1.5 km east of Emperor Qin Shi Huang's Mausoleum, near Xian, in Lintong County, Shaanxi Province. Some of the well known visitors include Queen Elizabeth II, President Ronald Regan, most recently President Bill Clinton and Mr. Bill Gates of Microsoft. Beijing, Xian, Hangzhou, Wuzhen, Suzhou, Shanghai. Beijing, Xian, Chengdu, Chongqing, Downstream Yangtze River Cruise, Shanghai.